How do you feel to learn THESE are the folks who’s ‘capable hands’ our children’s education has been entrusted? It doesn’t take much to mobilize the PC Police these days. There WERE a lot of comments. More than 100 on the screen capture from one site. But mysteriously, they’ve all been scrubbed. They are pulling the Yearbooks because one of the students wrote something upsetting in it. What was the ‘upsetting’ thing that was written? 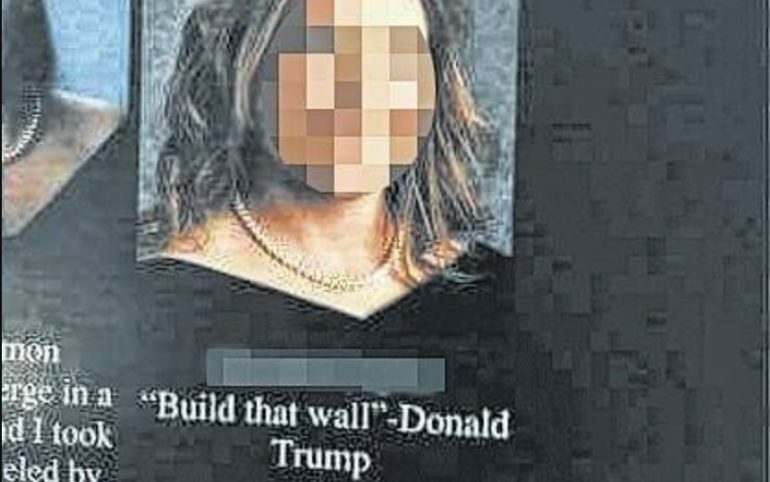 They started recalling the yearbooks this week after a screenshot of a blonde female student’s photo with Donald Trump’s campaign slogan as her quote appeared on social media. This isn’t just some lame backwater school. This one brags about being the cream of the crop! It’s part of something called the ‘Schools To Watch’ Program, a national program which places it among the top 400 schools. So it would seem that the ‘excellence’ to which they are committed includes a lot of things, but a commitment to the First Amendment is NOT among them. Share this with someone who still has faith in our public school system.